The all-new third generation Kia Sorento will be unveiled in Korea next month, featuring bold, swept-back exterior styling. The new model sports a lower roofline, higher beltline, more muscular stance, rounded shoulders at the rear, and deeply sculpted body surfaces. Together with a larger, more upright ‘tiger-nose’ grille, these design changes raise the aesthetic sophistication of Kia’s best-selling SUV. 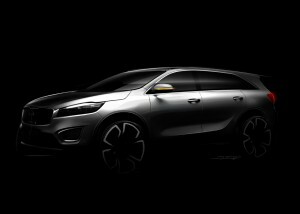 Styled at Kia’s design studios in Korea, Germany and the USA, the new Kia Sorento will be showcased in Korea at the end of August, and is due to make its world motor show premiere on Thursday 2 October at the 2014 Paris Motor Show. Click on the short video of the third generation Sorento being rendered at Kia’s design studio in Korea.